Since a lot of people have been saying 1:8 is the way to go and I love the idea of being able to super detail things I was wondering what you guys would consider a good 1:8 model to start with (that isn't overly expensive). What are your thoughts? Tough question with several possible answers my friend. To be helpful, some questions have to be asked of you first. The first is an honest assessment of your skill level -experienced or novice? Next is what you consider 'overly expensive'? There are several 'inexpensive' 1/8 kits to be found by Monogram or Revell of 1/8 muscle cars which are at the 'easiest' level of construction. They can be nicely detailed however. Of the Pocher classics, the 1907 FIAT can be considered a 'starter' kit for Pochers. But it is more expensive and complex than the first choice. 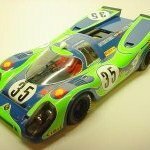 The Pocher presents a good out of box build but really improves with added detail - your skill and choice. Other Pocher kits - classic and contemporary - are levels (way) up in complexity, cost and rarity. 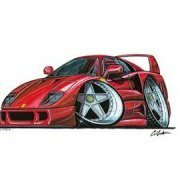 Beware Pocher kits of Porsches and Ferraris which generally go unbuilt and get quickly sold on the auctions. There are many beautiful 1/8 builds here both kit and scratchbuilt; a search will be educational. It does indeed help, kind sir. I would say I am somewhere in between novice and experienced. I have a fair understanding of how things work but I definitely wouldn't consider myself to be experienced. More like an enthusiastic amateur in all honesty. I do think the Pocher kits are very expensive indeed however I feel they might be worth investing in. I have recently gotten really interested in cars from the 1920s-1930s and I would rather build something from that era opposed to something more modern. The Pocher Bugatti T50 look absolutely amazing but it looks incredibly complicated. Might be worth testing the waters with something a bit cheaper first would you not agree? I certainly agree a 'starter' is best way. The Bugatti is NOT entry level. See build on here by 'Crazy Crank' Thierry. Search the FIAT and see if you like it. A reminder; extensive tools and expenses for paint (a lot of it) and materials must be considered. Not trying to discourage you - the opposite in fact. Absolutely, factor in working abroad as well as other distractions (kids).... Thanks for your input though! Is that the Wespe T35 you're on about? I have a few gripes with that one, it is very expensive and to be blunt not very good! It appears I have underestimated your familiarity with the subject. Apologies for that; only meant to inform, not give sermons. I just realized you're the perpetrator of the 1/18 Burago in progress. You certainly know your way around an airbrush and glue. Shifting gears, I now can recommend either the Pocher Muletto or Monza. But not the highly innacurate Spyder (see Endeavor's thread) - You certainly appear up to that kind of challenge. No it 's the Art Collection Auto/ J P Fontanelle one, with brass body panels. There were only 25 kits made. I think I've seen one kit change hands in about 10 years. Told you it was rarer than hen's teeth! Aaah the ACA kit, a work of art in its own right. Would almost be a shame to build it. Absolutely stunning, too bad it is that rare! dismantle it and build it again using your skills. The Bugatti is NOT entry level. I think I'd have a different point of view. I've built the Torpedo Rolls, Monza and the Bugatti as OOB, for sales display, and I would say that the Bugatti is better produced and easier to assemble as a kit. I have great respect for your opinion Jo for I feel your skill level is above mine and I have not built the Bug kit. Your Pocher work has been outstanding. I have built the Alfa Spyder and of course the Rolls. I'll concede the somewhat simpler Bug does not have 80-part wire wheels and a somewhat simplified engine. My advice to our friend TGA was based on the the fact that he asked for a 'starter kit'. Knowing from experience that most all Pochers have poor leverages and materials for the working features like steering, brakes and engine movements, I discounted those models from my suggestion to him. It appears that I may have misjudged his experience level by recommending the FIAT. Not my intention. But it does fit his bill for a beautiful replica at reasonable entry fee. Also, he requested a selection that 'isn't overly expensive' - something that may be considered of the Bugatti more than the FIAT. The point made earlier about 'fun per/dollar/hour' is certainly valid but I have no idea what Tom considers 'expensive'. Certainly a $1000+ USD Bugatti kit is in that range. And I surely do not wish to limit his ambition or 'fun quotient'. Yes, I can't do the last word either. Never built a Merc, for a start! I know that TGA said that he was looking for something inexpensive and a starter kit, but he does seem to like Bugattis. You said that the Bugatti had a simplified engine. The early ones had a gear drive off the front of the crank that spun the cams and operated metal valves and springs. Has that disappeared along with the differential? I highly respect all of your opinions and I shall definitely keep them in mind if I make my decision. I'll probably work on some more models before and go for something decent after summer. Something is definitely pulling me towards the Pocher kits which, for the considerable time it will take me to assemble one, I would say are great value for money. I am madly in love with Bugatti at the moment but that Alfa 8C Monza is so very tempting too..... Maybe I'll get myself that damned Wespe T35 and completely redo it, but what's the use in that? Too many choices!!!! That Testarossa seems to come floating past every now and again. What's wrong with that kit? I have seen many a half built Testarossa or ones for parts. Follow Jo's advice above as well as this; I had the TR new in the '90's. After thoroughly inspecting it, I sold it - unbuilt. I can give you a litany of what's wrong with it. .You said that the Bugatti had a simplified engine. The early ones had a gear drive off the front of the crank that spun the cams and operated metal valves and springs. Has that disappeared along with the differential? Far as I know that is still true. But by 'simplified' I meant the castings of the induction, block and heads, not a lack of working features. They are just blocks of metal shapes, lacking the beauty of the Alfas, Rolls and Benz. Subject to individual taste of course. If I may Tom, for inspiration I suggest a look at the site of David Cox, Pocher Specialist. There you will find Pochers of every stripe and some highly modified, extreme ones too. David is a commission builder but his favorite customer is himself. He also welcomes questions and contact. Oh please do. You' ve gotten me all excited now haha. I have the Pocher Testarossa in my part-built stash. Too many problems to complete. Some very weird things for an 8th scale kit. The rear-view mirrors bolt to the doors. If you look at the Tamiya 1/24th TR, they are mounted on the A pillar! I don't think that this will ever get built. Avoid! I believe that the early TRs had a single high rear-view mirror, but legislation meant that subsequent cars had two lower fitted mirrors. Yes, the single A-pillar mounted mirror was only installed on early Testarossa's. I've build 2 Pocher TR's and 5 F-40's. Curious to find out what you find wrong about the TR kit.